This public holiday in Thailand marks the day when the Lord Buddha delivered his first sermon at Benares in India over 2,500 years ago. The exact date of the holiday is determined by the waxing moon and the lunar months, but is usually held in July or August. The Buddha preached his first sermon at a deer park and from this sermon the Dharma (doctrine) of the Buddha was symbolized as a wheel. The Dharmachakra is also known as the Wheel of Life, Wheel of Law or Wheel of Doctrine and can be seen on flags in temples and buildings all across Thailand. Similarly, pictures or models of deer can often be seen at temples or in depictions of the Buddha. Like many other Buddhist festivals and holidays, Asahna Bucha (also written as Asalha Puja and other combinations) is a day when Thai Buddhists will make merit and visit the local wat (temple). 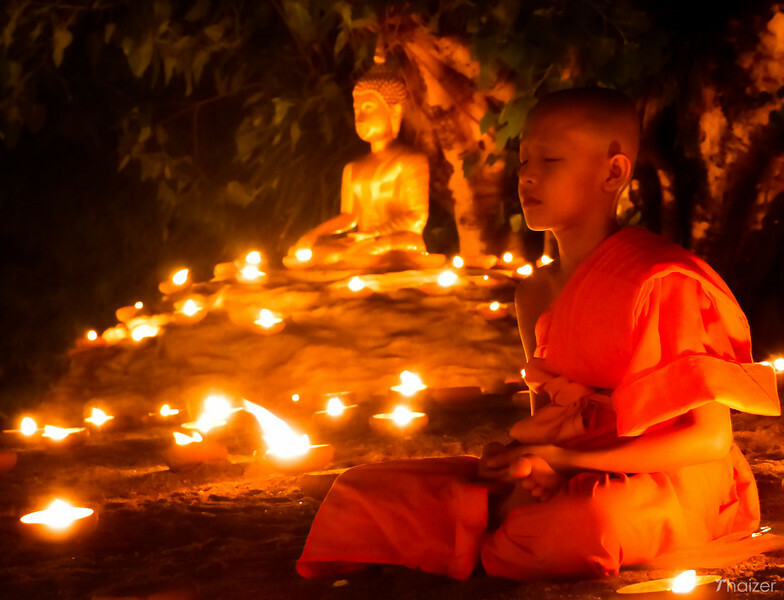 Traditionally, candles are amongst the items donated to the wat for Asahna Bucha and processions featuring candles are held at various towns in Thailand. The tradition dates back to the times before electricity where extra light was needed at the temple during the darker days of the rainy season. Local people will also ‘wian tian’ which involves walking around the wat with a lit candle, lotus flowers and incense. The day after Asahna Bucha is another significant day with Wan Khao Phansa marking the start of the three-month ‘Phansa’ period which is sometimes referred to as ‘Buddhist Lent’. ♦ Weather: when is the best time to go to Thailand?